It can happen in an instant! You were simply driving your car – possibly in auto-pilot- then out of nowhere another car swerves or an animal runs in the road, and suddenly you slam on your brakes. 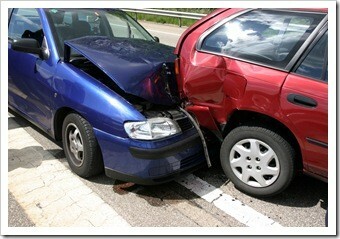 Most often we avoid the collision of another object but often in cases we don’t. Unfortunately, this sharp stop can be more harmful than you first suspect. Your spine houses and your spinal cord. The first cervical vertebra, Atlas or C1, is the most freely movable vertebra in the spine and the one most likely to cause irritation or tension to the spinal cord. It pivots around the second cervical vertebra, the Axis or C2, connected only by ligaments and tendons, but has no disc, making it uniquely different from the rest of the spine. This unique feature is what allows the majority of spinal rotation to occur but at the price of instability. Now add a sharp stop – especially one of an automobile or mechanical vehicle, which combines more speed and force, and your head or neck trauma can cause a misalignment of your spinal vertebrae. Today, intensive research studies have demonstrated that any collision greater than 11mph is dangerous because it can cause whiplash and misalignments to your cervical spine and damage to underlying muscle, ligaments, and surrounding tissue, leading to further problems with your nervous system. C1 and C2 are most vulnerable and if left undetected and uncorrected can lead to nerve interference, which results in poor function inside the body and deterioration in your health. A study published on August 2, 2004, in the peer-reviewed “Journal of Vertebral Subluxation,” showed that the onset of both Parkinson`s Disease and Multiple Sclerosis were statistically related to trauma to the head and or neck. The study also showed that a high percentage of the patients in this retrospective study benefited significantly from chiropractic and soft tissue rehabilitation care. This study reviewed the cases of 81 patients with either Parkinson`s Disease or Multiple Sclerosis. Of the 81 patients, 78 recalled that they had experienced at least one head or neck trauma before the onset of their disease. Of the patients in this study, 39 reported that they were involved in auto accidents, 29 noted that they had been involved in some sporting accidents, such as skiing, horseback riding, cycling, and football and 16 were involved in falls such as on icy pavements or downstairs. The length of time between the traumatic event and onset of their disease varied from two months to 30 years. All 81 patients received specific chiropractic care for correction of spinal misalignments. The results were astounding! Of the 44 Multiple Sclerosis cases, 40 (91%) reported improvement from the chiropractic care. Of these, 28 showed “substantial” improvement; 8 showed “moderate” improvement, and 5 showed “minor” improvement. No further progression of Multiple Sclerosis was noted in the improved cases during the care period, which ranged from one to five years depending on the patient. Only four cases reported “no change” in their condition. Of the 37 patients with Parkinson`s Disease, 34 (92%) reported improvement. Of these patients, 16 showed “substantial” improvement; 8 showed “moderate” improvement, and 11 showed “minor” improvement. As with the MS patients, no further progression of Parkinson’s Disease was noted in the improved cases during the care period, which ranged from one to five years depending on the patient. Only three cases reported “no change” in their condition. The conclusions published in the Journal showed that a causal link exists between trauma-induced upper cervical (neck) injury and disease onset for both Multiple Sclerosis and Parkinson`s Disease. Correcting the injury to the upper cervical spine (C1 and C2) with chiropractic and soft tissue rehabilitation seemed to arrest and reverse the progression of both of these diseases in the patients in this study. These results offer hope to patients who suffer from these debilitating diseases. Why Wait? What is Stopping You? There are so many variables involved in how an accident occurs, as there are with the individual victim, so it is impossible to predict an exact pattern of symptoms. It may also be the case that injuries are felt within an hour of the accident, or not until weeks or months later. Generally, though, there is an array of conditions that are very often seen after a whiplash injury such as neck pain, headaches, TMJ problems, brain injury, dizziness, and low back pain. Whiplash injuries should be treated by specially trained professionals who know and understand this condition early before disease processes can begin. The most effective treatment combines chiropractic care with a rehabilitation of the soft tissues, and a self-care routine. So why wait until you become sick. Our expert team which can include chiropractors, physical therapists, registered nurses, and massage therapists have been created for you to teach you about how to get well and stay well, for life. We recognize that true health comes from effort and when we start taking responsibility for our choices, we can return to the best of health and stay there! We Can Help in Atlanta! 855-589-7325 and visit our website at http://www.APICpro.com. We are available to serve you as soon as today with multiple clinic locations throughout the Metro Atlanta area.